Question: Should I turn off the air conditioner unit when not home? I have a small home with an older AC unit. My electric bill cost has been very high in the summer months. I am trying to save some money and I know the air conditioner is the reason. Does turning the AC off when I am not at home save money in the long run? Answer: NO. Savings will be minimal if any. Do not turn the AC completely off. The AC will run longer to cool down when you get home. This will use more electricity to get the home cool after you let it heat up all day. The longer the AC runs the higher your electric bills will be. This also causes unneeded strain on the AC unit. Because of this it is not recommended to completely turn the AC off. The AC has an easier time maintaining temperature for 8 hours than to run full out for 2 hours when the home is hot. If you turn the AC completely off and your house heats up during the day, the AC will run longer, cost more money, and use more energy to cool the home back down. Maintaining the temperature is always better than pushing the A/C unit to cool down from higher temperatures. 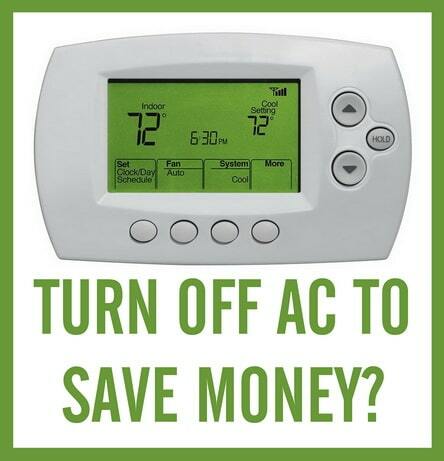 To save money, maintaining the temperature is the best way to reduce electric bills and extend AC unit life. – Do not turn the AC completely off. – Turn the AC temperature up 3 to 5 degrees from normal. – Use a programmable thermostat. – Automatically turn the temperature up when you leave. – Regularly change the AC air filter. – Have regular maintenance done on AC. The AC will be “strained” when turned on after being turned off all day. Many technical issues can come from straining the AC unit. It will reduce the AC lifespan as parts and components are pushed to the limit. With air conditioning, your location is always a factor. Where you live, the type of housing, weather, temperature, and humidity all have a factor in considering how to run and maintain your AC unit. In certain circumstances, turning the AC off may let humidity accumulate in the home. Mold or mildew may override the energy savings. Need help? Please leave your question below. Give detail about the situation or issue with your air conditioner. We will be happy to assist and try to troubleshoot any issue you may have. Next post: What Causes The Bad Smell In My Dishwasher?